-> This note contains relevant changes for 1099INT and 1042-S files. The format of the other files, i.e. 1009MISC, were not changed. Hence, this note has to be implemented only if you are generating 1099INT and/or 1042-S files. I have seen some incidents being raised regarding 1099 and 1042-S withholding tax forms for the tax year 2016 to be submitted to IRS in 2017. 1) When will the notes for 1099/1042-S forms with the changes for tax year 2016 be released? 2) Will the Smartforms still be delivered and supported for tax year 2016? For on-premise ERP customers the Smartforms will be still delivered and supported for tax year 2016. Hello Ester, as you mention in this topic, still would like to confirm with you. Are we looking for new note release for 2016 on similar topic as 2227185/186 – US Legal Change 2015 – 1099 and 1042 Smartforms and Adobe Forms? Please confirm. Would like to catch up on any other related notes if its out there. Before it’s too late. Indeed the notes that will be released on end of November, beginning of December for 1099 and 1042-S forms will carry the relevant changes for tax year 2016. Any updates on notes yet? Note 2398337 was released. I updated the blog with the note link. Any update on this note ??? 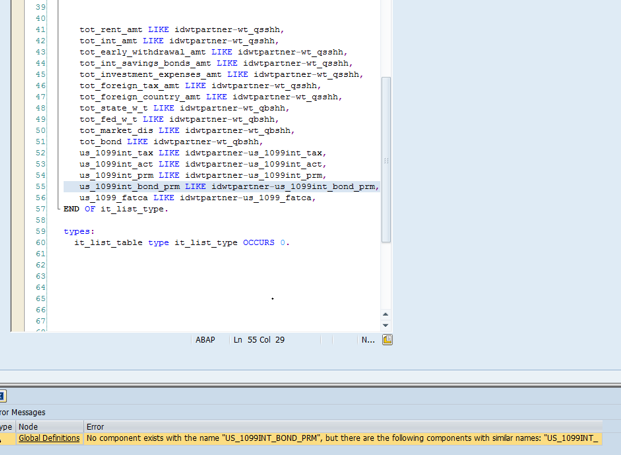 While implementing SAP note 2398337, we found some Prerequisites notes like 2284579. Do we need to implement these prerequisites notes as well? We are on SAP_FIN = 617 (SAPK-61710INSAPFIN) and SAP_APPL = 617 (SAPKH61710) SP level 10, so it is suggesting to implement 2284579. We download and checked in our system and this note can be implement in our system. But again this note has prerequisites to implement note 2240297…and it goes on…Do we need to implement all these pre-requisites notes? For you information, we just upgraded our system in Month of July 2016 from EHP4 to EHP7. 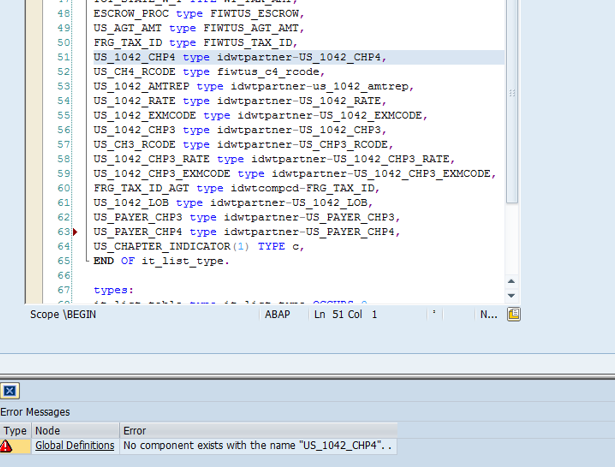 Also for first step ‘Implement the structure changes as mentioned in pre-implementation steps of the SAP Note‘ we can see the structure DWTPARTNERADD_US and GSS_RFIDYYWT_PDF has different versions than what it given in screenshots in file ‘Manual_Canges.pdf‘. So we are confuse and in question if we have correct version of this two structure. Can we just append given fields in both structure and activate as mentioned in file Manual_Canges.pdf‘? Attaching images of current version of structure in our development system. To apply Note 2398337, it looks like the following notes need to be applied as pre-req. I am unsure if 2272423 needs to be applied but it does create a data type of US_NATIVE_CTRY which you add to the GSS_RFIDYYWT_PDF and IDWTPARTNERADD_US. You create that data type following the Manual Activities.pdf in that note. Where does 2272423 fall in the Note implementation order and is the order I have above correct? Note 2398337, manual_changes.pdf shows the us_native_ctry in the screenshot to update the IDWTPARTNERADD_US structure as already in that structure. Hello Easter, Our system is @ SAP_APPL 604. Last note that we applied in 2015 were 2227185-86 now we tried feeding note 2398337 and we are getting IDWTPARTNER structure are missing some of fields – same error for 1042s, 1099 MISC, INT (see print screen). Hello Easter, We have also tried applying below link solution. still getting same error. We are also facing the same issue. Were you able to resolve this ? Is there any update on notes on Electronic File. Hello. I’m in the process of testing the Adobe forms for CY 2016 1099-MISC. I have gone through the steps for note 2398337 and everything looks good. However, for vendors in foreign countries, it is printing the country name too far down. We did not have this issue before because it would not print the country name. How do I either move it up or not print it? Also, I wonder if anyone else has heard that the entries in box 7 need to be submitted to the IRS by January 31. The actual forms are still mailed out by that time, but the electronic file to the IRS needs to be submitted earlier than normal. Is anyone else just going to send box 7 file to IRS or the entire file? Any feedback on my question above? I have installed OSS Note 2398337 successfully. I have loaded the Smartforms and am now trying to load the Adobe forms but am getting an error ‘Error occurred while processing request’ when trying to upload the form in SFP. Has anyone run into the same issue? Anyone could upload the form in SFP successfully? My client doesn’t currently have Java installed in his system and he doesn’t have plan con get it installed soon. For this reason ADS can not be installed either. Though, he still needs to process tax year 2016. My question is: can we use smartforms instead of adobe forms? Will they show the same information? Thanks and sorry if this question has been answered in a different post. I’ve been digging for hours but I haven’t been able to find the answer. I have implemented the legal changes note Forms: 2l398337 – US Legal Change 2016 – 1099 and 1042 Smartforms and Adobe Forms. Forms available under this note for MICS is only copy B – Smart form (form no.3 from below list) is available, however as per the USA legal requirement there are 4 more forms, which are not there in the current note. Do i need to implement any other notes? or is it there any way to get all the forms print from SAP. When will the 1099 for 2017 be released by SAP?